Tetracyclines are a class of derivatives of polycyclic naphthacene carboxamide, which have attracted wide interest in the pharmaceutical field for their use as antibiotics. These molecules are characterized by a substantial conformational flexibility and by the presence of different binding sites which endow tetracycline with a noticeable capability in binding biological targets. A salient property of tetracyclines is the presence of multiple acidic groups: four equilibrium constants have been measured for the fully protonated tetracycline (TCH3 +) but so far no clear information concerning the pKas of the various sites has been reported. 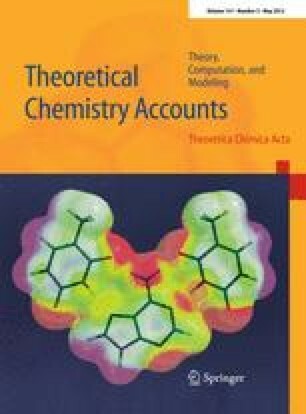 We present here a computational investigation on the correlation between the acid–base and the spectroscopic properties of this important class of compounds. Starting from the TCH3 + species, the pKa of all the possible deprotonation sites has been computed by DFT calculations. The computed pKas nicely compare with the experimental data, within 1 pKa unit, allowing us to individuate the products of the first deprotonation. This procedure has been iteratively repeated using as starting species the products singled out from the previous deprotonation, thus individuating the stepwise products of each deprotonation step. Then, the optical absorption spectra have been computed for all the species involved in the protonation/deprotonation equilibria, comparing the results with the experimental data. The good agreement between theory and experiment has allowed us to rationalize the correlation between the solution pH and the absorption spectra. The online version of this article (doi: 10.1007/s00214-012-1218-7) contains supplementary material, which is available to authorized users. AA, SF, and FDA thank Fondazione Istituto Italiano di Tecnologia, Project SEED 2009 “HELYOS”, and MIUR-PRIN 2008 (2008CSNZFR) for financial support. BC and FE gratefully acknowledge the financial support of the Ministero per l’Università e la Ricerca Scientifica e Tecnologica (Rome, Italy) and the University of Perugia [PRIN 2008, n. 20088NTBKR] and the Fondazione Cassa di Risparmio di Perugia.